Why a website about folding bikes? The Folding Cyclist started out as a blog and forum over 10 years ago to connect folding bike enthusiasts. There were quite a few lively discussions about the different bikes on the market, the origin of the folding bike, organizing ride meet-ups and sharing ride photos. It then slowly transitioned into what you see here today. Sadly the forum disappeared because it took way too much time to moderate though it may return at some point in the future. What's so darn interesting about a bicycle that folds that warrants a whole website dedicated to them? A folding bike really is the ultimate utilitarian transportation machine. You can use it as part of your commute by throwing it your trunk and driving part way or taking it on public transportation. You can travel on a plane with it, typically without paying onerous regular bike fees, and have ready green transportation to sightsee when you arrive at your destination. And you can easily store it indoors, away from the weather and thieves. It's a take anywhere, go anywhere, personal transportation machine that allows a spontaneous change of place to impart new vigor to the mind. Also, since bicycles in general are iconic symbols of human civilization, over the years quite a few inventors have been drawn to the challenge of designing a bicycle that folds in a cleaver and compact way but also rides well. We've lost count of the number of designs that have been sent to us over the years for our opinion and feedback and they are a very popular subject matter at quite a few industrial design schools. Recently, there have been quite a few crowd funded folding bike projects on Kickstarter and the like enabling the prospect of an inventors design turning into a business enterprise. Some of these designs are intriguing, some probably won't do so well in the market for one reason or another but nonetheless, folding bikes seem to spark the inventive spirit! Are folding bikes as good as regular bikes? Since the vast majority of folding bikes have smaller wheels than a "regular" bike, many people are wary that they may not ride so well. The main concern is that it may require more effort to pedal a small wheeled folding bike, this isn't true. Typically small wheeled folding bikes have a larger front chain ring and gearing set-up that takes into account the smaller wheel diameter thus requiring about the same pedaling effort. Smaller wheeled bikes actually accelerate a bit faster but a downside is that they may not handle larger rocks and curbs as well as a bike with a larger wheel diameter. There are full-size folding bikes that feature 26" or 700c wheels and their ride quality is basically indistinguishable from a non-folding bike in the same price range. As for build quality, most folding bikes are built to fairly high standards in factories that typically have ISO certification. Obviously the main difference between a folding bike and a standard bike is the ability to fold and thus the inclusion of a hinge or other similar mechanism that allows the bike to fold to a more compact size. Some may think that the addition of this ability to fold may compromise the structural rigidity and perhaps the safety of the bike. Both concerns are logical but unfounded. While they may have been true in early folding bikes built years ago, most modern folders are designed to specifically ameliorate both issues and very few safety issues have been reported. If your purpose is to incorporate biking into a multi-modal commute then a folding bike is clearly superior in most ways to a regular bike due to the portability and storage factor. While it is true you could just put a bike rack on your car and use a non-folding bike, many public transportation systems don't allow them and once you get to work, it may be problematic to get it in the elevator, navigate the hallways and fit it into your office or even worse - your cubical. Most public transportation systems do allow folding bikes and they are easy to navigate in an office environment. There are bikes available in most every category to suit your purpose: touring, urban commuting, mountain biking, recreation, and high performance. So unless you are competing in events that require highly specialized bikes, you are sure to find a folding bike that should fulfill your purpose. That's a question we get a lot, but it's the wrong one to ask. You should ask "what is the best folding bike for me"? Since only you can determine what is the best set of features and functionality that satisfies your needs and budget. There are over 200 folding bike brands and most are pretty well made. The best way to determine which bike is best for you is to test ride a few and see what suits you best. 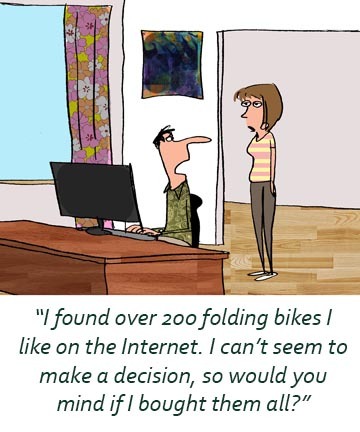 Do you sell folding bikes? 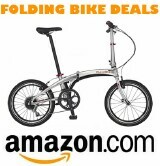 Where is the best place to buy a new folding bike? Ideally it is best to buy a folding bike from a local shop so you can test ride it and have local support. However, it's often the case that many local shops don't carry folding bikes and if they do, it is a very limited selection and their knowledge of the products may be wanting. There are many reputable internet shops to buy from, just make sure they have a generous return policy and after-sale warrantee support. If you can't find precisely the type of bike configuration you are looking for, one of our sponsors, Bike Friday, makes bespoke models so you can order a bike custom built to meet your exact needs and specifications. I have an old vintage folding bike, can you identify who made it and when? Email us some good photographs of your bike, we can usually identify it. Sometimes we get stumped, typically with bikes that have been repainted or significantly modified. In the case of foreign bikes, oftentimes you can do some sleuthing on Google by knowing the foreign language term for "folding bike", look to the right margin of this page for a helpful language list. If you have what you may think is an interesting or historic folding bike, it could end up in the Photo Gallery! How much is my vintage folding bike worth? There isn't a robust market for old folding bikes so it is difficult to put a definitive price on one. If it is rare or unusual it may have significant value but condition is everything. If you come across what you think may be a valuable folding bike, email us some high quality photos and we'll give you a value price range based on auction and private sale data. The follow-up to this question typically is, where can I sell my vintage folding bike? Ebay is a pretty good place to give it maximum exposure to a global audience of buyers. You also might try posting to the folding bike subsection of Bike Forums, collectors and other interested parties frequent there. While it may sound glib, the ultimate answer to what it is worth is - it's worth whatever someone else is willing to pay for it!